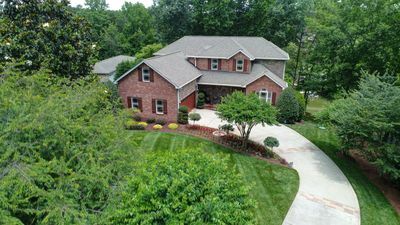 Please click on the Calendar link to see if our house will fit your vacation. 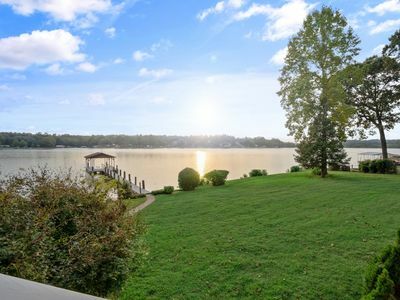 Lake Norman is the largest lake in North Carolina, with over 520 miles of shoreline. 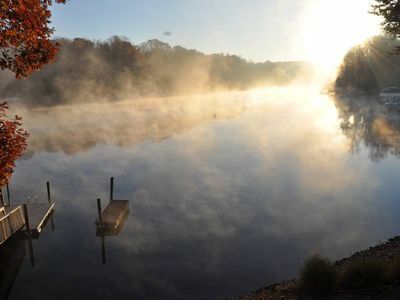 The warm water is perfect for swimming, boating, fishing and relaxing. 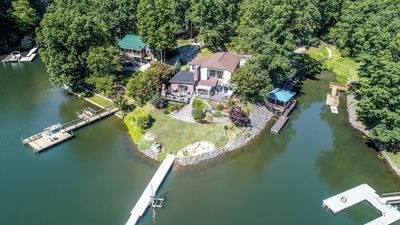 The house is located on a quiet cove on the northeast side of the lake, easy to access from Interstate 77, about 40 miles north of Charlotte, just minutes from Lake Norman State Park. 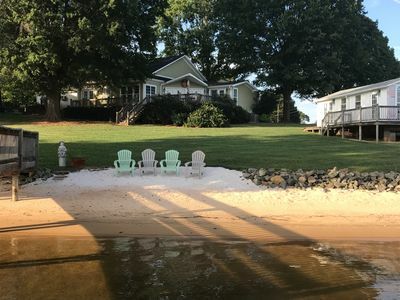 Easy day trips can be made to Charlotte, Hickory, Lowe's Motor Speedway, Paramount's Carowinds Theme Park, the Biltmore Estate, and many other local attractions. There are also nearby restaurants, shopping, go-karts, and plenty of other activities, if you want to stay busy. 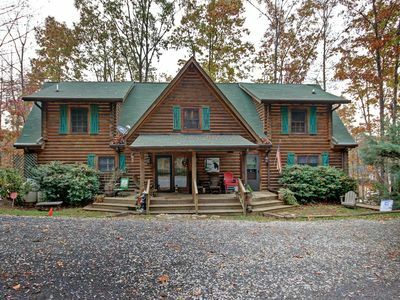 The house sits on a large .7 acre wooded lot and is a perfect getaway any time of year. 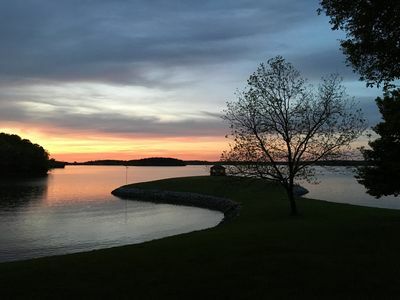 The lake water is perfect for swimming from May thru September, with canoeing, kayaking, sailing, boating and fishing available all year. 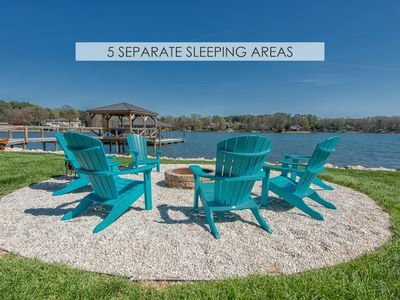 The outdoor fire pit is a hit all year as well, while the 2 indoor stone fireplaces make everyone warm and toasty from fall through early spring. The hot tub is fun all year too. Inside the house, the loft overlooks the great room, which has a soaring cathedral ceiling and a big stone fireplace. The master bedroom, with a private master bath, is also located on the 1st floor, along with a 2nd bedroom and another full bath. 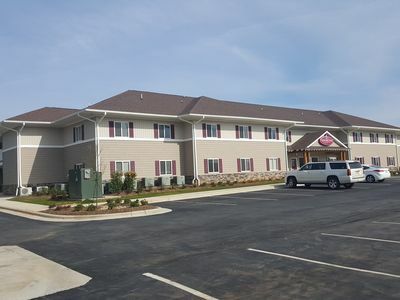 Completing the 1st floor are the dining room, screened porch/outdoor dining room, and complete kitchen with electric range and oven, refrigerator with ice maker, microwave, coffee maker, blender, toaster oven, mixer, and more. The loft has 3 single beds, which are comfortable for kids or adults. Access is up a fairly steep stairway/ladder, so be careful. It's a great hang-out for kids, and a place for them to escape from their parents. The lower level has 2 more bedrooms and a 3rd full bath. 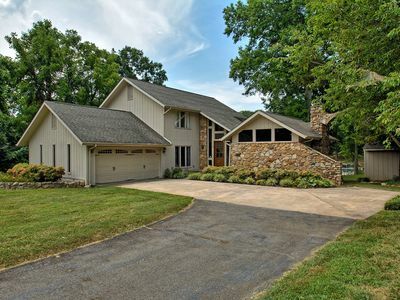 It also has a large family room with a wet bar and another big stone fireplace. 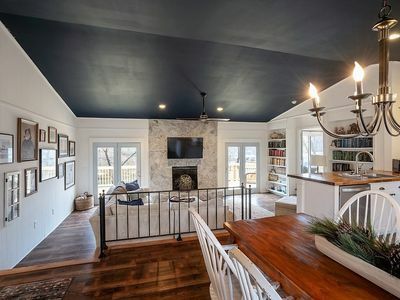 There's a wrap-around couch in front of the fireplace and TV, and also a futon for additional seating or sleeping. 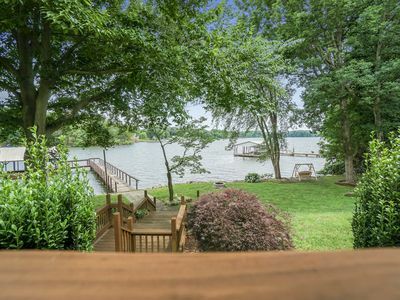 The deck that spans the 1st floor in back of the house has a steel cable rail, so it doesn't block views of the private dock and the lake. 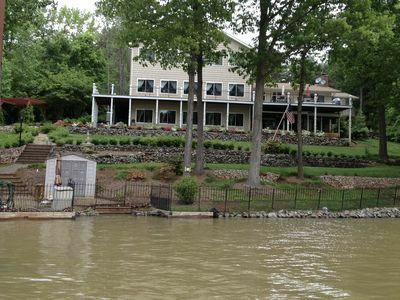 The hot tub, with wrap-around deck and steps, is nestled in overhanging dogwood trees overlooking the lake. A few steps away is the large fire pit, great for cooking hotdogs or marshmallows, or warming up on a cool fall day. The deep water dock averages 11 feet of depth, and even had 8 feet of water under it during the 2007 drought, so we could take boats out while many others were aground. 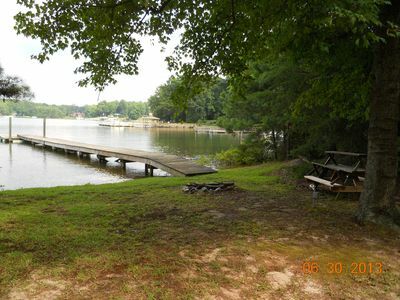 Rent a boat nearby, or bring your own - the community boat ramp is about 150 yards down the street. The dock also has 4 canvas swinging chairs (with cup holders) mounted on springs and swivels. 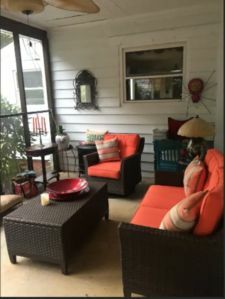 Sitting in one of those chairs, sipping your favorite beverage, a cool breeze in the air...there just isn't a better way to relax. 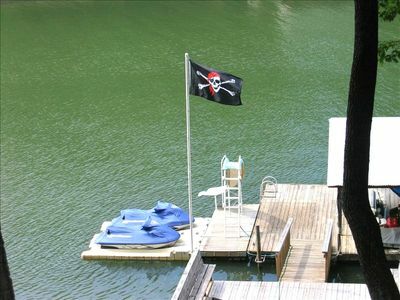 But if you have to work during your escape, don't worry...THE SECURE WIRELESS NETWORK WORKS AT THE DOCK! Weekly rentals during the summer go from Sunday to Sunday. The rest of the year you can check in and check out whatever day you'd like, as long as you're able to stay at least two days. Please click the Calendar link to see if our house will fit your vacation. 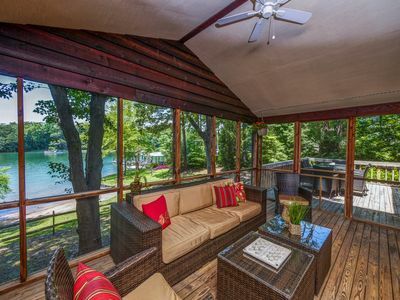 A Waterfront Cottage With Amazing Views ! 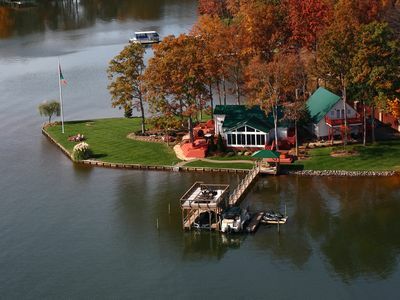 Spacious Log Cabin on Lake Norman Great off Season Rates!!!! 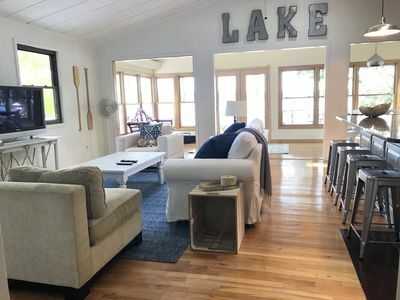 Lake House Getaway...Where memories are made and worries are left behind! 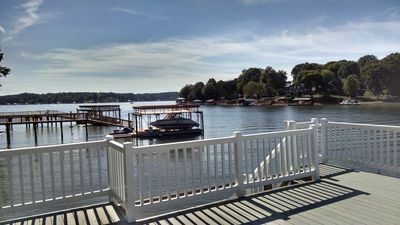 Lake Norman Cottage near shopping, Lowe's corporate, NASCAR and Charlotte!